Karoo Lark provides online messengers for AIM, Facebook Chat, Google Talk (Gtalk), Yahoo! Messenger and Windows Live Messenger (MSN). First, companies or schools may block some popular instant messaging service port using their network firewall, like websense. If this happen to you, in your offices or at your schools, you may not be login and lose opportunity of contacting with your friends or someone you care. Karoo Lark web messenger, a web page, which can solve this problem for you. As we know, most of network does not block web page. So you can get login and everything goes smoothly as you expected. Second, there are so many messengers existed there. Each time you turn on your computer, those messengers pop up and occupy almost all of your desktop window space. And most of all using lots of memory & CPU calculating, which will make your computer running slowly. Karoo Lark web messenger load all instant messaging services inside one web page. All you need is just to open it with a modern browser. It is running with less memory & CPU time. And it does not pop up any windows to annoy you. You may already know Meebo, eBuddy or other web messengers. Karoo Lark web messenger is providing better service in different UI layout . Use it anytime, even if Meebo, eBuddy or other web messenger services are down or being blocked. Google has acquired Meebo, the pioneer of web messenger service provider, for 1 billion US dollars. And Meebo/Google has announced that they will shut down a lot of services, including the common web messenger service. Meebo.com has been shut down on July 11, 2012. We respect Meebo for all they have done for serving web messenger service in the last few years. We just want to say a respectful "Goodbye Meebo". For those (tons of) Meebo web IM users, who may feel being abandoned, we, KarooLark web messenger service, want to say "Hello KarooLark web messenger", welcoming those users to join us. We are providing similar and better (in some aspects) we messengers. We think you will like our web messenger. We are free and available without downloading anything. We support multiple login cross all IM networks. We support user picture and personal status message in almost all IM networks. AOL Instant Messenger, known as AIM or AIM Messenger, is a well-known instant messaging service provided by AOL. It once dominated 52% of United States IM market (2006). Stand-alone official AIM client software includes advertisements and is available for Microsoft Windows, Windows Mobile, Mac OS, Mac OS X, Android, iOS, BlackBerry OS. Some US companies may block AIM service, both official desktop AIM messenger and AIM Express web messenger. In such cases, KarooLark web AIM messenger helps users stay contacted with their friends. Windows Live Messenger, well known as MSN Messenger or MSN, is a well-known and widely used instant messaging service provided by Microsoft. It has about some hundred million users world wide. It provides messengers for both Windows and Mac OS. It also provides mobile messenger for iOS (iPhone/iPad) and Android. And it provide web MSN messenger too. Some companies may block MSN service, both official desktop messenger and official web messenger. In such cases, KarooLark web MSN live messenger helps users stay contacted with their friends. Google Talk (Gtalk or Gtalk messenger), is an instant messaging service provided by Google. Google integrates Gtalk in all kinds of other services, from desktop Gtalk, Gmail Gtalk, Gtalk Gadget, Android Gtalk to Google Plus. Even though Gtalk is not as popular as MSN, it is a fast growing service that is becoming more and more popular. KarooLark Larks' web Google Talk (or web Gtalk, or online Gtalk), is originally designed to provide web Gtalk messenger with similar user experience to Gtalk desktop client. Google provides web Gtalk in Gmail and Gtalk web gadget officially. But user experience in these 2 products is not as good as Google Talk desktop client. 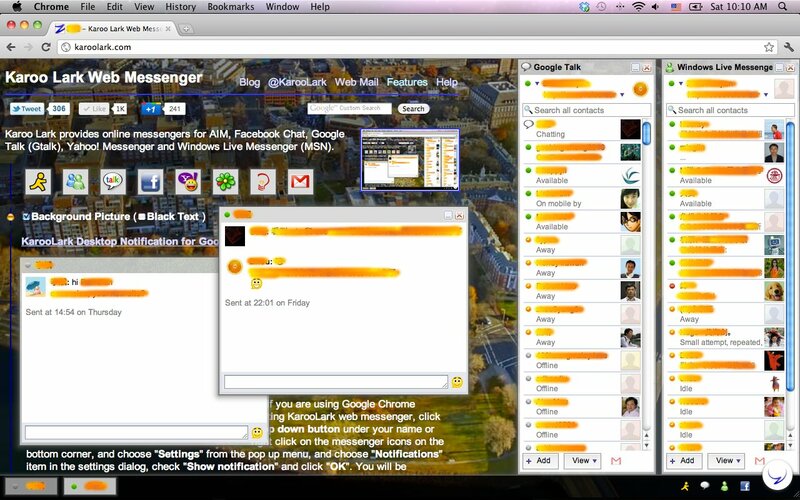 KarooLark web Google Talk messenger's UI looks like Gtalk desktop. And we believe it give a better user experience to our Gtalk users. Some companies may also block Gmail and Gtalk services.In such cases, KarooLark web Gatlk also helps them access Gtalk and stay contacted with friends. Facebook Chat (FB Chat), is the instant messaging service provided by Facebook. Facebook embeded this services in its web pages at first. Later, in early 2010, Facbook provided Jabber/XMPP access. Facebook had 750 million users in a 2011 report. Karoo Lark's web Facebook Chat provides 3 ways to access Facebook Chat services: Normal Jabber/XMPP login with username and password, Facebook app login with access token and web login with email and password. KarooLark web Facebook Chat only provide chatting. Feed stream reading and publishing is not supported right now. Some companies or some countries block all services of Facebook. So lots of Facebook users (some millions) have to find their way to login Facebook: proxy, VPN, SSH tunnel or others. KarooLark web Facebook chat helps users to login Facebook and chatting with their friends there. Yahoo! Messenger is an old instant messaging services. It is popular in some countries, especially in United States. Yahoo! provides normal Yahoo! Messenger, Yahoo! Messenger Express (or Yahoo! Web Messenger), and normal mobile messenger. Karoo Lark's web Yahoo! Messenger (or online Yahoo! Messenger) provides a different UI layout while comparing to official Yahoo! web messenger. We think KarooLark's UI is simple and easy to use. Some companies may block Yahoo! Messenger services. KarooLark web Yahoo! Messenger help unblock this popular instant messaging service too. More reviews will be listed as it comes later.